Specially formulated for the treatment and prevention of Athlete's Foot. Mycota Cream is a tube containing: Zinc undeconoate 20% w/w, Undecenoic acid 5% w/w. Has both antifungal and an antibacterial properties. Treats and helps to prevent Athlete's Foot. Can be used in conjunction with Mycota Powder and Mycota Spray. A Pale off-white cream in a 25g aluminium tube. 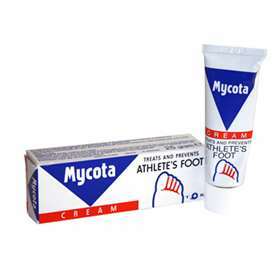 Mycota Cream is a topical antifungal and antibacterial medicine for Athlete's Foot. For treatment, wash and dry affected area and massage into the skin night and morning, particularly between the toes. In addition, dust with Mycota Powder. Wear clean socks or stockings each day dusted inside with Mycota Powder. Continue for 1 week after all evidence of infection has cleared. For prevention, rub in each day to clean feet. In addition, dust socks or stockings inside with Mycota Powder. If you are pregnant or breast feeding, consult a doctor before taking this medicine. Active Ingredients are Zinc undeconoate 20% w/w, Undecenoic acid 5% w/w. Liquid Paraffin, Emulsifying Wax, Perfume compound, Purified water.